Plan, build and test changes to your services to ensure seamless updates. Easily keep track of changes. Changes, called “Request for Changes (RFC)” in ITIL, are actions that modify a service or any of its components. Service Desk helps you justify their time and expense while streamlining the management process. 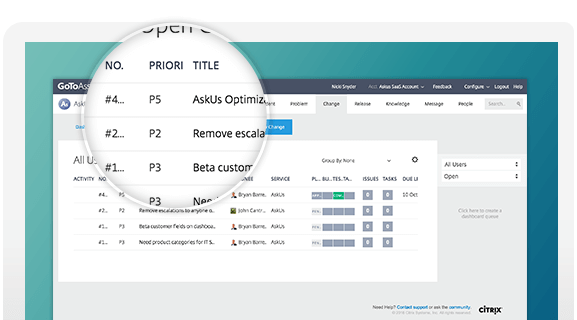 It uses built-in approvals and consistent workflows to minimize the business impact, so you can plan and make changes with confidence. Go through the change lifecycle. Service Desk handles changes in phases: planning, approval, building and testing. Your team can collaborate to plan the change, post updates as the new design is built and then review and test the implementation. You can also link it to related incidents, problems and releases to create a clear audit trail. Your customers rely on your services. That means any change you make will have a real effect, so make sure it’s a positive one. Service Desk helps you implement changes in a tightly controlled manner to shorten or even prevent service interruptions. For each change, you can quickly build a list of necessary tasks and assign the right technicians. They will receive an automatic notification, and you can then keep an eye on their statuses to see how the change is coming along. 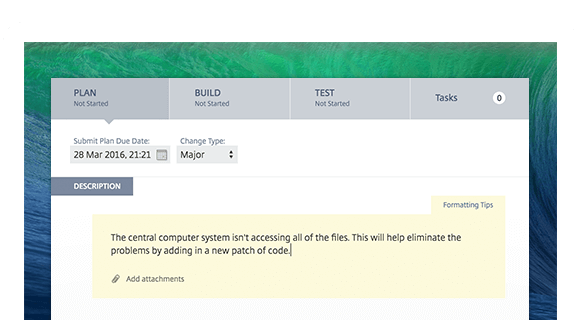 Easily manage deployments and schedule outages to avoid release mistakes. See how people, machines and locations are related so you can quickly determine impact.